THIS IS NOT exactly a brand spanking new book review. The Running Man was published in 1982, two years before I was even born. What is fascinating is that despite its age the book still reads very fresh and is the best book I’ve read from King (albeit I’ve only read Joyland as well). The setting and imagined world is not so very far from reality and fairly prophetic of modern society – this ability to predict or imagine what the future can bring is something that seems to draw me to writers whether Orwell, Vonnegut or Bradbury. It shows an intellect, a mind that has thought about this small world and what might befall it. It is very alluring to me. And I’m not even a huge Sci-Fi fan either, although I’m slipping into it’s grip: no bad thing. The Running Man reads like a sick parody of modern TV culture, but really isn’t that far fetched. It was written before all the contemporary TV programmes which feast on the reality aspect. The pace is perfect and the world that King conjures is brilliant, solid characters, a protagonist you can root for and enough drama and twist and turns to keep you blazing through the pages. 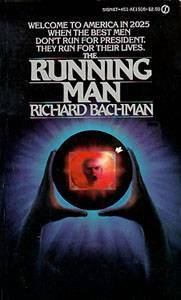 The book follows Richards who decides to enter The Running Man, the chance to win $1b New Dollars, if he can survive for 30 days, being hunted on a nationally televised programme by the public and designated Hunters. If you like futuristic writing, that doesn’t try to reach to far into it then you’ll love this book. King questions Western morality and delves into the aneasthetised psyche of humanity, if it can be called that, but not too deeply leaving the plot and story to carry you along. You might have watched the film based on the book, starring Arnold Schwarzenegger which came out in 1987 and is a bit of a classic. I haven’t seen it recently and not since reading the novel, so I’ll see how it stacks up. From what I can remember Hollywood did what Hollywood does. It’s nice to read the odd review of older stuff as well. I love this book and for me the film adaptation wasn’t all that bad. If you’re new to King I would suggest reading ‘Carrie’ – it’s a classic for a reason. Carrie is on my list to read, seems to be the one everyone mentions of his. I just watched the film today and was sadly disappointed that A) it wasn’t as good as my 9 year old mind remembered it being and B) it doesn’t stick to the book at all, apart from the title, very little stays intact from the book to screen – maybe an update is due? Thanks for your input and stopping by.